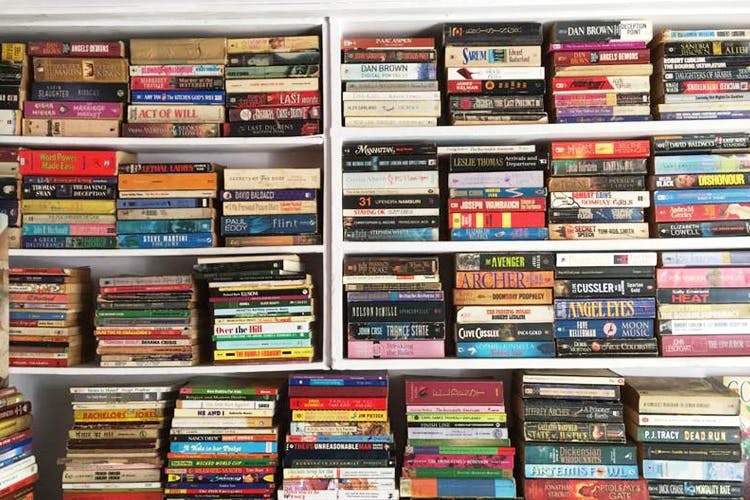 We found a tiny, 20-year-old secondhand bookstore in Seven Bungalows, Soni Papermart, selling books for INR 50 and upward. Soni Papermart was started off by Amratlal Soni who mainly used this space to sell newspapers to the local residents, closing in on two decades now. Slowly over the years, Amratlal began buying books in bulk from people who leave the city, or wanted to sell them off. The same books that may originally have cost INR 300, are ow being sold off for INR 50 upwards. The collection that started off small, began expanding and is now diverse and brimming with authors often unheard of even. The store has an old clock hung there lending to the vintage look of the bookstore, though it’s really crammed for space. However, the books are lined and organised on the shelves well, and Amratlal is more than happy to give suggestions. The smell of the old books, and the fact that these books have had their own journey. The charm of secondhand books lies in the fact that the books go onto have a second life, with memories from the first one. We often find scribbling from previous owners in the margins, underlined important passages or even the unsuspecting forgotten bookmark that jumps to life. These books start as low as INR 50. The book editions are old, paperback and lovely. We found To Kill A Mockingbird, columns full of John Grisham, Victorian literature, regional authors and even the suspense thrillers by Dan Brown and Sydney Sheldon. All in all, it’s a cute shop to pick up a few books from if you’re ever in the hood. Head to this bookstore for picking up old books, or just to chat with the owner. After all time spent with books is never wasted. Where: Shop No. KWX, 22, Near Shiv Mandir and crossing of seven bunglows, Andheri West.